Rhubarb (Rheum rhabarbarum) is a species of plant in the family Polygonaceae. They have large leaves that are triangular, with long fleshy stalks. They have small flowers grouped in large compound leafy greenish-white to a rose-red cluster of flowers. Rhubarb (Rheum rhabarbarum) is a species of plant in the family Polygonaceae. They have large leaves that are triangular, with long fleshy stalks. They have small flowers grouped in large compound leafy greenish-white to a rose-red cluster of flowers. The stalks are the only things eaten because the triangular leaves are extremely high in oxalic acid, which can cause severe illness in people. This is why many people believe that rhubarb is poisonous. Contrary to the belief, rhubarb contains many medicinal effects. 1. Rhubarb is low in calories. Rhubarb contains only 21 calories for every 100 grams. This makes rhubarb one of the lowest caloric plants, perfect for weight loss. 2. Rhubarb can be protective against heart disease. Rhubarb contains antioxidants that fight off heart disease. Also, rhubarb is extremely low in fat and cholesterol, and can increase the levels of HDL (“good”) cholesterol due to the presence of dietary fiber. 3. Rhubarb is perfect for improving your digestive health. Like most vegetables, rhubarb is an excellent source of dietary fiber. Fiber can aid prevent constipation and stimulate the contractions of the smooth muscles that forces food through your system. The daily recommended fiber intake for men and women are 38 grams and 25 grams, respectively. 4. Rhubarb is great for improving blood circulation. Rhubarb contains trace amounts of copper and iron. These minerals are vital for new red blood cell stimulation, increasing total red blood cell count and enhancing the overall metabolism of the body. Individuals deficient in iron is known to have anemia. 5. Rhubarb may help improve bone health. One cup of rhubarb contains 35.7 micrograms of vitamin K or 45 percent of the daily recommended needs. Sufficient vitamin K consumption acts as a modifier of bone matrix proteins, improves calcium absorption, preventing bone loss and osteoporosis. 6. Rhubarb can help fight or delay Alzheimer’s disease. 7. Rhubarb can help prevent cancer. Rhubarb is a good source of antioxidants like beta-carotene, lutein, and zeaxanthin. Antioxidants have been able to neutralize free radicals throughout the body. Free radicals are wastes from cellular metabolism that can cause healthy cells to mutate or die, resulting in cancer or other chronic diseases. Cao, C. F., & Sun, X. P. (1998). Herbal medicine for periodontal diseases. International dental journal, 48(S3), 316-321. Huang, Q., Lu, G., Shen, H. M., Chung, M., & Ong, C. N. (2007). Anti‐cancer properties of anthraquinones from rhubarb. Medicinal research reviews, 27(5), 609-630. Öztürk, M., Aydoğmuş-Öztürk, F., Duru, M. E., & Topçu, G. (2007). 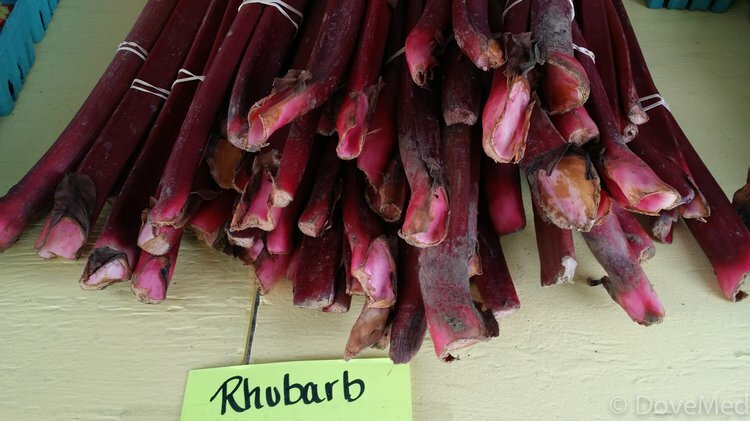 Antioxidant activity of stem and root extracts of Rhubarb (Rheum ribes): An edible medicinal plant. Food Chemistry, 103(2), 623-630. Basu, T. K., Ooraikul, B., & Garg, M. (1993). The lipid-lowering effects of rhubarb stalk fiber: A new source of dietary fiber. Nutrition Research, 13(9), 1017-1024. Ying, R., Chongshun, S., & Jing, G. (2003). Experimental Research on the Mechanisms of the Effect of Compound Rhubarb Antiaging Preparation for Enhancing Memory. JOURNAL-BEIJING UNIVERSITY OF TRADITIONAL CHINESE MEDICINE, 26(3), 35-37.